Sometimes you need to hire multiple people at the same time for the same role – say 3 customer care representatives for a call center. 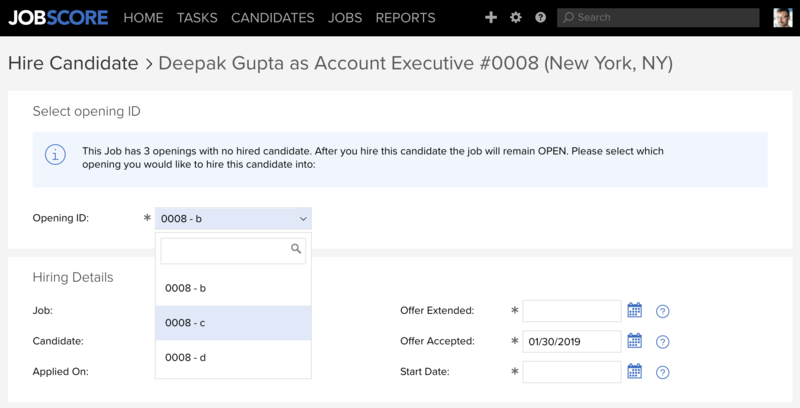 Until today, to do this in JobScore you’d visit the hire candidate page and click to “keep hiring.” JobScore would create a copy of the job; move the hired candidate into the copied job; mark them hired; and leave the original job open for you to keep working on it. Jobs can now only be filled if a candidate is hired into every opening. If you are hiring just one candidate for a job, everything is largely the same, but if you need to hire multiple people for a role, openings make hiring cleaner and easier to manage over time. If you want us to clean up your old data and merge copied jobs into jobs with multiple openings, please contact support@jobscore.com and we can take care of that for you. The hire report now shows a list of openings with hired candidates instead of a list of filled jobs. This is because you can have hired candidates in a job that is not filled, e.g. you’ve hired 3 of 5 people for a project and are still working on it. The hire report no longer includes calculations for days to hire and days to start for a job. As you can have multiple hires for each job, these calculations don’t work anymore. If you want to know how long it took to fill a job, please use the “Days Open” value shown on the Job Manager. JobScore plans that limit the number of open jobs (e.g. the professional plan with 10 open jobs) are now based on the # of unfilled openings, not just the # of open jobs. So if you have an open job with 3 openings with one hired candidate, it counts as 2 out of your 10, not 1. Job openings unlocked the ability for us to start coding job approvals. Please contact support@jobscore.com if you’d like to participate in the upcoming approvals beta.